U.S. Secretary of State Mike Pompeo holds a news briefing at the State Department on February 1 in Washington, D.C. The United States announced on February 2 that it is suspending compliance with the Intermediate-Range Nuclear Forces Treaty with Russia. The treaty bans both countries from developing or using medium-range nuclear missiles. Russia said it too will abandon the landmark agreement. The inf Treaty dates back to the 1980s when Cold War tensions were soaring, and both the U.S. and the Soviet Union were building ever larger and more capable nuclear arsenals. One land-based Soviet missile system called the SS-20 was a significant upgrade from existing technologies. Highly accurate, capable of being easily hidden and redeployed, and able to carry multiple nuclear warheads that could hit multiple targets, the SS-20 was viewed as a game-changing system. Its most remarkable characteristic was its “Goldilocks” range: 3,400 miles. The range was short enough to comply with strategic arms limitation treaties that were in place, but it was long enough to put most of Europe within striking distance. In answer to the SS-20, the U.S. developed the land-based Pershing ii. Like the Soviet system, Pershing ii was mobile, easily concealable, remarkably accurate and able to strike multiple targets with warheads hundreds of times more powerful than the bombs dropped on Japan, in just a few minutes. In the Cold War’s deterrence environment, the SS-20 and Pershing ii were inherently destabilizing. The speed with which they could strike targets left little or no time for political and military leaders to make decisions. This significantly increased the likelihood of a global nuclear war erupting over a false launch warning. Both sides recognized the high stakes, and when Mikhail Gorbachev became leader of the Soviet Union in 1985, he publicly set a goal of eliminating all nuclear weapons by the year 2000. Ronald Reagan, president of the United States at the time, welcomed the Soviet proposal, and the two sides negotiated the removal of some of their nuclear weapons—especially the intermediate-range systems that so drastically heightened the risk of miscalculation. The negotiations took many months, with numerous starts and stops along the way. Eventually sanity prevailed, and on Dec. 8, 1987, the two men signed the inf Treaty. It specifically prohibited ballistic and cruise missiles with ranges between 300 and 3,400 miles. Both sides made good on their commitments, destroying existing systems and agreeing to ban future development of them. As such, the inf Treaty drew the world a step back from the brink of nuclear war. Four years later, the Soviet Union disintegrated, giving way to the Russian Federation. After a decade of chaos and instability, former kgb agent Vladimir Putin became president, and began working to restore Russian power to its Soviet levels. Putin did not agree with Gorbachev’s decision to sign the inf Treaty anymore than he agreed with the decision of his other predecessor, Nikita Khrushchev, to give Crimea to Ukraine. As with the Crimean decision, Putin began reversing what his predecessor had done with the inf Treaty. In 2008, although the treaty was still officially in force, Putin’s military began developing a weapons system called the ssc-8. This land-based cruise missile system has a range believed to be 1,500 miles, making its development a blatant violation of the inf Treaty. After six years of quiet ssc-8 development, the Russians tested the system for the first time in 2014. The Obama administration decried the test, urging Putin to adhere to the inf Treaty. In clear contradiction of the evidence, Putin denied that the ssc-8 violated the treaty and forged ahead with development. By February 2017, the ssc-8 was fully operational, with two deployed battalions. In the time since, the U.S. and Europe have repeatedly called Russia out on this flagrant and dangerous violation, but with no change in the Kremlin’s behavior. The Trump administration said that the U.S. could not continue on as the only country bound by the inf Treaty. 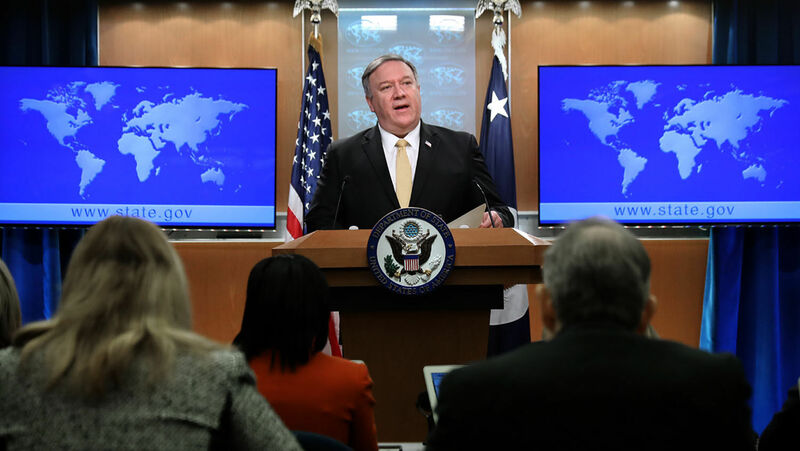 “[F]or almost six years, the United States has gone to tremendous lengths to preserve this agreement and ensure security for our people, our allies and our partners,” Secretary of State Mike Pompeo said at the State Department on February 2. Pompeo explained that Russia’s violations put the lives of “millions of Europeans and Americans at greater risk” and America at a “military disadvantage.” He then reminded the audience that in December 2018 the U.S. made a notable attempt to convince the Russians to abide by the agreement, and said that if they failed to do so within 60 days, America would suspend its obligation under the treaty. The U.S. says that at this point the move is only a suspension, but that in six months, if the Russians have not ended their treaty violations, the withdrawal will be official. The Russians, as expected, are playing the victim. They are accusing America of destabilizing the world by leaving the inf Treaty. But that is an obvious misrepresentation of the facts. And now, largely because the Europeans are frightened by Russia’s increasing aggression, the risk of global nuclear war is increasing. The inf Treaty was an unquestionably positive development for mankind. But it was never a guarantee of lasting peace, and now it has collapsed. None of man’s various treaties and peace plans are able to secure sure and lasting peace. In all such ideas, there is nothing to forcibly prevent unfathomably destructive weapons from being used. And there is no true cause for hope. But there is hope in the Bible. Mr. Flurry makes the Bible’s plan for a sure and hope-filled solution clear. But he shows that the Scriptures also contain some chilling warnings, showing that man’s peace efforts will increasingly fail and that nuclear war will erupt in the near future. Matthew 24:21-22 record Jesus Christ as saying: “For there will be greater anguish than at any time since the world began. And it will never be so great again. In fact, unless that time of calamity is shortened, not a single person will survive” (New Living Translation). This could only be describing a global nuclear war with enough detonations to cause nuclear winter. And it will threaten to end every human life on the planet. Amos 5:3 shows that in some cities, only 10 percent of the population will survive. Jeremiah 2:15 shows that other cities will be entirely scorched by nuclear devastation, without a single inhabitant left. These are alarming prophecies, and the suspension of the inf Treaty brings them closer to fulfillment. Nuclear World War iii will be interrupted! Before the world powers detonate enough nuclear and other weapons to entirely obliterate mankind, Jesus Christ will cut the violence short. Just after that season of unprecedented war, Christ will usher in an age of unprecedented peace. Amos 9:14 shows that the cities that had been left with only 10 percent of their populations will be rebuilt. Jeremiah shows that as the people rebuild, each individual will come to know the true God and to keep His law. As a result, the “great joy and peace” that Mr. Flurry mentioned will fill the world. Regarding this future time of worldwide tranquility and prosperity, Isaiah 2:4 says: “[N]ation shall not lift up sword against nation, neither shall they learn war any more.” War, nuclear and otherwise, will then be a relic of a bygone era.